Updates Boy’s Basketball Evaluations Schedule for 2019 Hibbett Gym April 23 and 24 Current 6th grade 3:00-5:00 Coffee Gym April 24 and 25 Current 7th grade 4:00-5:00 April 24 and 25 Current 8th grade 5:00-6:00 Dome Gym (HS) April 29-May 3 current 9th, 10th, 11th grade 3:30-5:00 *Each player must have an updated physical to participate in evaluations. 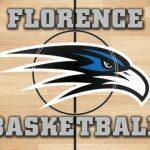 Tonight’s basketball games against Lawrence County (TN) have been moved to the FHS Dome. Games will begin at 4:00 PM with the varsity girls playing at 6:00 PM and the varsity boys at 7:30 PM. 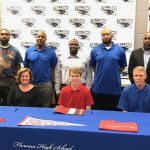 Congrats to Florence Basketball’s Bryant Reid on signing a basketball scholarship to Huntington College.